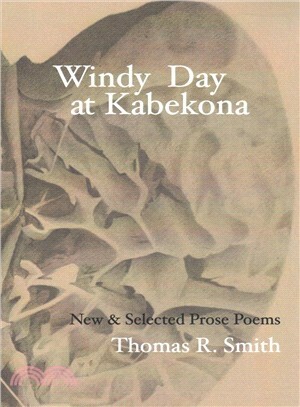 Windy Day at Kabekona samples four decades of Thomas R. Smith's devotion to the prose poem. Inspired in the late 1970s by the visionary prose poetry of Rimbaud and Baudelaire, as well as American originators such as Robert Bly and Louis Jenkins, Smith has made the prose poem his own from his early surrealist-flavored efforts to later approaches emphasizing landscape and acutely-drawn character portraits. Behind all his varied practice, Smith writes that he has felt “the salutory, restless pressure” of his models, pushing him to meet the high bar set by their example. Windy Day at Kabekona showcases as never before the forty-year arc of his exploration of the enlivening possibilities of the contemporary prose poem. Thomas R. Smith is a poet, essayist, editor, and teacher, whose work has appeared in numerous journals and anthologies in the U.S., Canada, the U.K., and Ireland. He is author of seven books of poems, Keeping the Star (New Rivers Press, 1988), Horse of Earth (Holy Cow! Press, 1994), The Dark Indigo Current (Holy Cow! Press, 2000), Winter Hours (Red Dragonfly Press, 2005), Waking Before Dawn (Red Dragonfly Press, 2007), The Foot of the Rainbow (Red Dragonfly Press, 2010), and The Glory (Red Dragonfly Press, 2015).